4 Bedroom Semi Detached House For Sale in Leamington Spa for Offers in excess of £300,000. A well presented, spacious four double bedroom terrace property benefiting from having a kitchen dining room and driveway parking located in South Leamington. The accommodation comprises, entrance hallway, dual aspect living room, large kitchen dining room and downstairs cloakroom. Upstairs are four double bedrooms and bathroom. 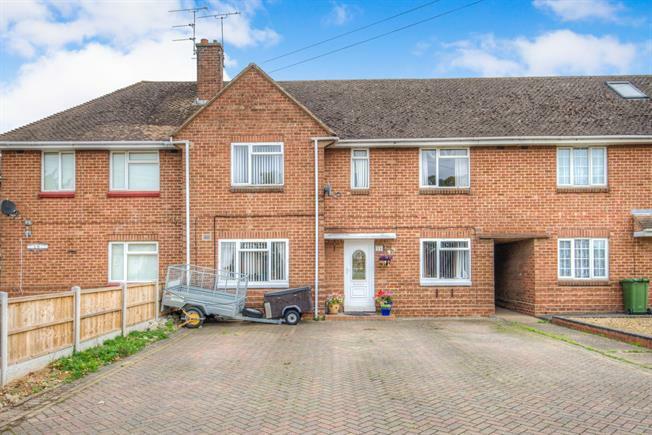 Outside offers an enclosed rear garden and spacious driveway to front. With doors leading to living room and kitchen. Having stairs rising to the first floor, radiator and tiled flooring. Dual aspect with window to front and double doors leading to the rear garden. Electric wall mounted fire, radiator and door leading to the kitchen. Fitted with a range of eye and base level units, incorporating a one and a half bowl sink with mixer tap and drainer. Space for cooker with overhead extractor. Space and plumbing for dishwasher, washing machine, dryer and fridge freezer. Tiled flooring, spotlights, window to rear and doors leading to rear, downstairs cloakroom and entrance hallway. Access into the dining room. Window to rear, tiled flooring and low level wc. With doors leading to all four bedrooms and bathroom. Window to front and access to loft via hatch. Window to rear, built in wardrobes and radiator. Fitted wardrobes, window to front and radiator. Fitted with a three piece white bathroom suite comprising a panelled bath with shower over, low level wc and pedestal wash hand basin. Radiator, tiled flooring, tiled walls, spotlights and window to rear. Spacious block paved driveway to front offering off road parking for several vehicles. An attractive, enclosed rear garden, with raised decked areas and lawn area. Mature borders stocked with shrubs and plants.